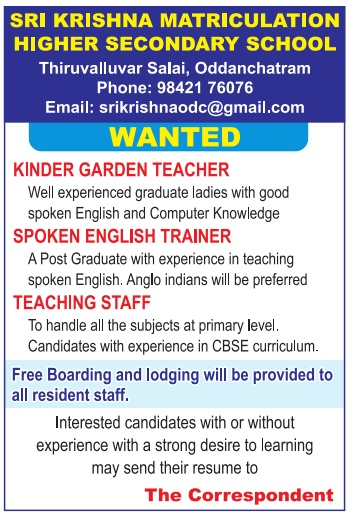 Sri Krishna MHSS, Oddanchatram has advertised in the DINAMALAR newspaper for recruitment of Teachers jobs vacancies. Interested and eligible job aspirants are requested to apply immediately from 29th July 2018. Check out further more details below. About School: Sri Krishana Matriculation Higher Secondary School is one of the best school in Oddanchatram town. This school reached the peak in short span of time by the way they educate the students. As the education is the basement for every human being it should thought to them in right way by the right person. Spoken English Teacher- A Post Graduate with experience in teaching spoken English. Anglo Indians will be preferred. Teaching Staff- To handle all subjects in primary level. Candidates with experience in CBSE curriculum. How to Apply: Interested candidates with or without experience with a strong desire to learning are requested to send application along with CV, copies of certificates and recent passport size photo to the postal address provided below.